This came in for framing last week. Isn’t it cool! Margaret likes to stitch while her husband fishes. We love to see all of her finished pieces. I guess we have framed at least 40 for her. She is always stitching for herself, her kids or friends. The name of the design is Blue Eyes by Kustom Krafts. We try to always keep this book in stock. Well all of the flowers frogs that I brought in last week are gone! To some wonderful loving homes…. This week I have two new ones, and we have not had a blue one in the past. Isn’t it great! Comments Off on Oh so tiny…. Our Wednesday group had a lot of fun this week. It rained all afternoon and we were warm and dry, stitching like crazy. Norma is working on a discontinued Mystic Stitch design called Summer Zinnias. We do have one of them left in stock though. She is stitching on 24 count congress cloth over one using 2 strands of floss and half crosses. The colors are so vivid and beautiful! 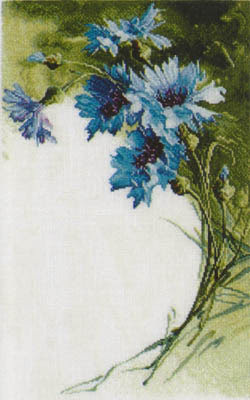 Karen is stitching Cornflowers by Dimple Designs. She is stitching on 28 count over one with one strand of floss using full and half crosses. It was so fun to see them work on these tiny stitch counts. This is a picture of the design when complete. The pattern can be worked on any stitch count, but the smaller the count the more detail it has. These will be gorgeous when they are finished. I will show you again then……. Look at these beautiful clear glass holders. The tiny one is my favorite. It holds 7 scissors and is only a little larger than an egg cup… I thought that the color of this was cool. It is a wonderful shade, not really green, and not really blue. It really depends on the light. This little dish is pink depression glass embossed with cherries. Everyone loves the pink glass. I have enjoyed my pink Fire King sugar cup long enough. I am ready to see it go to a loving home… Can you ever have too many?